At the U14 Player of the Month handover are Mark Wilson, Junior's Secretary from Banbridge Rangers, John Grant from firmus energy, Adam Loughlin, centre-midfield for Banbridge Rangers U14, Michael O'Kane from the firmus energy Mid-Ulster Youth League and Colt Cousins, 1st team captain of Banbridge Rangers. Banbridge Rangers U14 player Adam Loughlin was awarded the first firmus energy Mid-Ulster Youth League Player of the Month Accolade for his outstanding effort and contribution to the team. Described as a quiet and unassuming boy who lets his football do the talking, central midfielder Adam was selected out of the 11 players who were nominated from each U14 clubs in the firmus energy Midulster Youth league, which includes teams from Castlederg to Rathfriland and Enniskillen to Moira. Chairman John Patterson said, “Adam joined Banbridge Rangers FC in January 2013 and immediately settled into the squad. The coaches very quickly became aware that we had a serious player in the ranks. “He is a natural footballer who doesn’t really have a weak foot and is an integral part of the U14 team who has made the central midfield role his own. “He is one of the fittest in the squad and puts this to good use on match days as our long throw specialist - in fact, quite often his throw is better than a corner or free-kick as the opposition can’t quite believe how far it goes. “Adam loves a tackle and rarely loses any contact situation. He has scored many long range netbusters, but is also a player who will pop up in the box for an important goal from two yards. 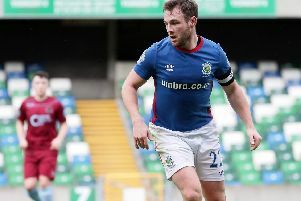 “He finished last season by helping the ‘wee Gers’ win the firmus energy MUYL league cup and got a goal in the final to cap a star performance. “He has brought that same form and attitude through to this current season as he helps the U14s strive for more firmus energy MUYL silverware and has earned many “man of the match” performances this season already. “He is on top form and we are very proud to have him as part of our squad. The Player of the Month is a new initiative introduced by the firmus energy Mid-Ulster Youth League as a way to recognise outstanding young footballers in each of the different age categories and improve confidence and a sense of achievement amongst players. Michael O’Kane from the Mid-Ulster Youth League explained: “Each month the award will recognise the best player of a certain age group and the U14 worthy winner was Adam Loughlin from Banbridge Rangers, so we would like to pass on our congratulations. “We look for players that demonstrate dependability, quality of play, commitment to the Club and coaches, and for players that are generally a good role model for their team mates. John Grant from firmus energy added: “Well done to Adam on his achievement to be selected out of so many dedicated and talented young footballers in the league. “We have been working in Banbridge for almost eight years, bringing the offering of natural gas to hundreds of homes and businesses in the area and as a local company it is very important to us that we support local communities. We are therefore delighted to be involved in this thriving league which helps so many young sportspeople improve week on week.